I really enjoy developing with React and I use it for all sorts of side-projects and at work too. Not only in our flagship product but for prototyping new ideas. The first time I heard about React I didn't quite get it and ended up dismissing it. Fast-forward to 2017 and we have React 16, which not only brought new features but also included a complete rewrite of the core architecture, codenamed "Fiber". Perhaps the most exciting area we’re working on is async rendering — a strategy for cooperatively scheduling rendering work by periodically yielding execution to the browser. The upshot is that, with async rendering, apps are more responsive because React avoids blocking the main thread. We think async rendering is a big deal, and represents the future of React. 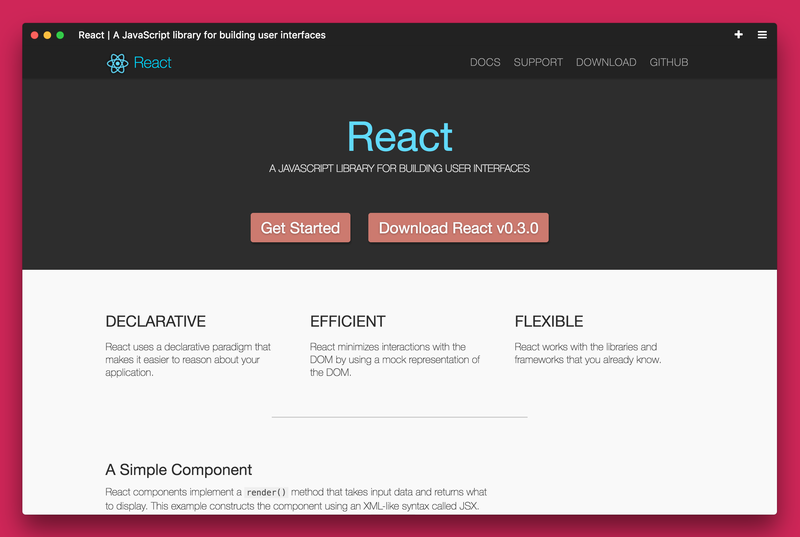 While React was maturing, the ecosystem surrounding it was evolving in many ways. One big part of this evolution was webpack, which has been widely adopted by the community. Speed isn't everything and too much asynchronous rendering can actually worsen the user experience. No one likes loading states and rendering pieces of your app asynchronously brings some new challenges. I maintain JS.coach and React.parts and thanks to it I end up reviewing many packages and reading a lot of tweets from the community. I have been made more aware of this problem thanks to a series of tweets by Andrew Clark, one of the key engineers that worked on Fiber. A thought exercise: If code-splitting is so great, and bundlers like Webpack make it easy, why don't we code-split every component by default? This kind of behavior is not trivial to accomplish today with React. We may need a paradigm shift to actually take our web interfaces to the next level. But thankfully it seems the React team is already on it. I'm grateful for all the work these individuals share and I couldn't be more excited about front-end development. I'll definitely be watching the stream March 1st.